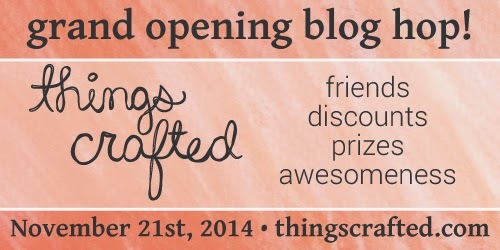 LINDA TRACE DESIGNS: ThingsCrafted Grand Opening BLOG HOP! Welcome to the ThingsCrafted Blog Hop!! This hop is chock-a-block FULL of amazing designers, get ready to have your socks blown off!! You might have come here from the incredibly lovely and talented Jennifer McGuire (having to come after her in a Blog Hop is both nerve-wracking and very exciting! ), if you didn't come from Jennifer's blog or would like to go back to the beginning of the hop, please go to the ThingsCrafted blog to start! A little background on ThingsCrafted: ThingsCrafted is a place where handmade design and customization come together to create a wonderful company who creates and encourages color, personality and community. ThingsCrafted was founded by Britta Swiderski, a designer with a background in the world of papercrafting and a history of working with awesome graphic design clients. ThingsCrafted provides custom products - starting with stamps - to suit your lifestyle all starting with handwritten designs. They all go from pencil to computer to your doorstep! We love to create stamps and designs for addresses, "made by"s for the projects you send to others, favorite phrases or shapes for project life and planner organization and so much more. I decided to go with a Medium Rectangle stamp because I wanted something that would be close to the width of a card, or at least to take up a large portion of my card. To show you how versatile it is, I made a second card showing how very different it can look. Something more modern and elegant! Love a stamp you can get a lot of uses from! Britta is also offering some pre-designed stamps for those that want to try something new and handmade but don't have a particular need for a custom stamp. I got this one: Adventure - and man oh man, I can't wait to use it. Here are the direct links to the other pre-designed stamps she's offering...I'll be getting these too. There's also a special treat for everyone in the blog hop - 15% off your order until Tuesday, November 25th using the code GRAND15OFF as part of the Grand Opening event! The next stop on the ThingsCrafted blog hop is one of my most FAVOURITE people in the whole world, Kelly Marie!. Such fun cards and the fonts is adorable. Great job. I'm really liking this font. Great cards. Beautiful! This us such a fun idea! 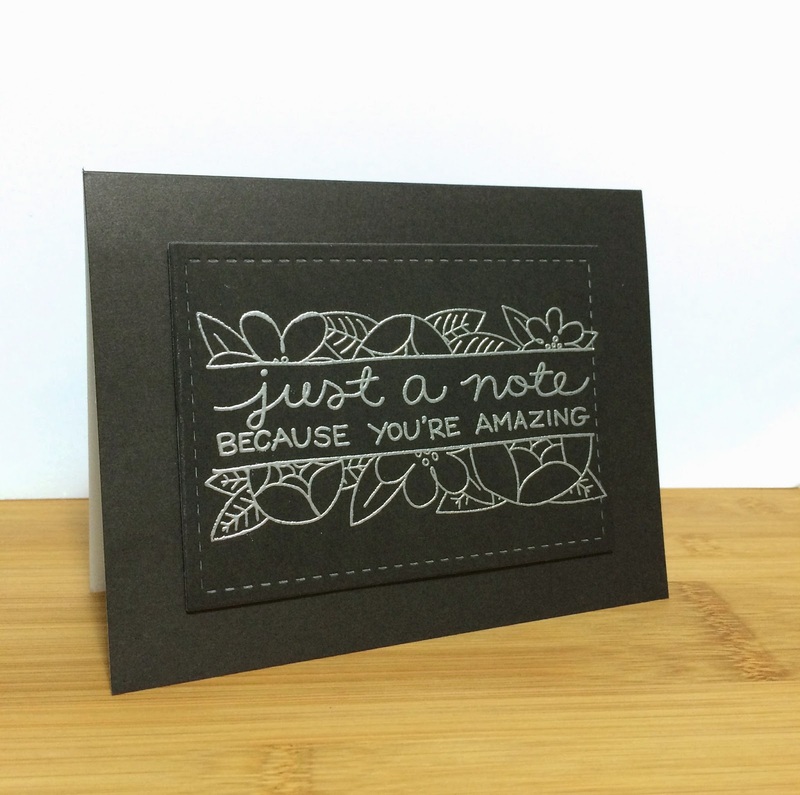 Oh my goodness, your custom stamp is awesome as are the beautiful cards you created with it! Amazing! I love the stamp and it looks gorgeous just stamped as line image but equally fabulous colored in! Oh, how pretty. Love that custom designed stamp... and it looks amazing heat embossed on black. Love the fonts and great gift idea! Thanks! It's really nice seeing the different custom stamps and how they are being used. Loved the embossed card. Great design that you chose! Great inspiration to showcase these new stamps . . . congrats to Britta! Love the stamp design, especially as it was used on your second card. Awesome! Thanks for the chance to win and good luck to Britta. Love these stamps! Great idea to have customized stamps and pre-made ones that are unique! Love the design you picked for your custom made stamp! Thanks for showing it's versatility! Cute cards. Love the style of script. Nothing else on the market like it. Like the designs that you could really use often with awesome lettering! Hi Linda ~ I'm so happy to see you're taking part in the hop! I love your custom stamp, and your cards are amazing! Beautiful coloring and such a fun design on the first one, and I love the elegance of the 2nd card!!! wow--love the stamp that you designed with the split flowers--how creative! I'll definitely have to check out this new company and order some stamps. Those cards are so pretty! I love the happy colors. Just love all of these cards! Great stamp creation. This company offers amazing possibilities. Great stamp designs! I love the first image colored and embossed! The card looked great in both color and embossed. What a wonderful design. I love your stamp, and your cards show just how versatile it is. Thanks for the chance to win such a great prize! Britta did such a good job! And I love your cards too! Sure like the black/gray card you made. Well done! Wow,I love the cards you've made with your cool customized stamp Linda! Beautiful stamp and getting in on the design of it is a super idea! Love your stamp, especially the second, elegant use of it! Love your stamp and both of your cards! Both looks so pretty! Great to see the kind of stamps that can be made to order. love the design of this one and your cards as well. The first one is fun and bright, but your second one is plainly awesome! Love Your cards and the saying. All of these are amazing stamps! My mind is whirling with possibilities now! TFS! That flower stamp is amazing! I love the design! You're custom stamp is just beautiful! I just love it. What a great place to have to be able to have you're custom stamps made. Great layout, love the fonts of your stamp! Darling cards! I love your two unique ways to use that amazing stamp! Great cards! Thanks for the chance to win. I'm lovin' the blog hop today! It's a great way to read new blogs! Beautiful cards. Love the bold colors and the CAS look of the first one. OK, what did I miss? I wasn't aware you could add designs, too. An already brilliant idea from Britta just became more brilliant!!! What a classy stamp. You're right--the black/silver card is definitely elegant. Love the custom stamp and the two completely different looks you achieved with it. Love your stamp design. Both cards are wonderful. I like that you can color or not & have equally amazing results. Great cards. This stamp is amazing! I like the way it looks fun or elegant depending on how you used it. Really neat cards and I can't wait to see what else Britta comes up with. Congrats on her new line of design! Very pretty coloring on the first card. I really like the sentiment for the adventure stamp. Thanks for sharing. This is just so cool.. Thanks so much for sharing. I love both cards. Same stamp, two different looks. I love it. Beautiful and amazing card, and the stamp is so awesome! Love your stamp design and your cards! Hey Linda! I love your cards. The designs for the stamps are amazing. Nicely done. What a wonderful way to illustrate how different the stamp can look depending on how you choose to present it. Thank you for sharing! Love this, and it's pretty both embossed, and colored! Thanks for sharing! Just love your "because you're amazing" stamp, Linda! And you colored it so beautifully on the first card and embossed it so elegantly on the second. Thanks for the chance to win! I love your stamp--and two totally different looks. Thank you for sharing your creativity with us. Such a fun stamp. Great cards! Love those clean and simple cards ~ Great job! What a clever idea we just need something special to fill up a card and these are great and I really like to use a custom stamp on the back of my cards. Both cards are cute, with the second having a wow! factor. Versatile cardmaking! It looks like both of you came up with a great design! 2 totally different looks! So versatile! I like what Megan said -- 2 totally different looks with one stamp, always makes a stamp more valuable! I love the two fonts together on the first stamp! Thanks for sharing all the great sentiment stamps you have on your wish list. And I love your two cards! both of the cards are fantastic. So, so cute. I really like the two styles. I thought it was just the sentiment, until I realized it was the whole image. Wow! That's amazing. Congrats to Britta! Very versatile sentiment, I can see were it would get lots of use. Love both versions of the card, too! Beautiful cards! I love the vibrant colors on the first one and the elegant look of the second one. Thanks for sharing. Wow! 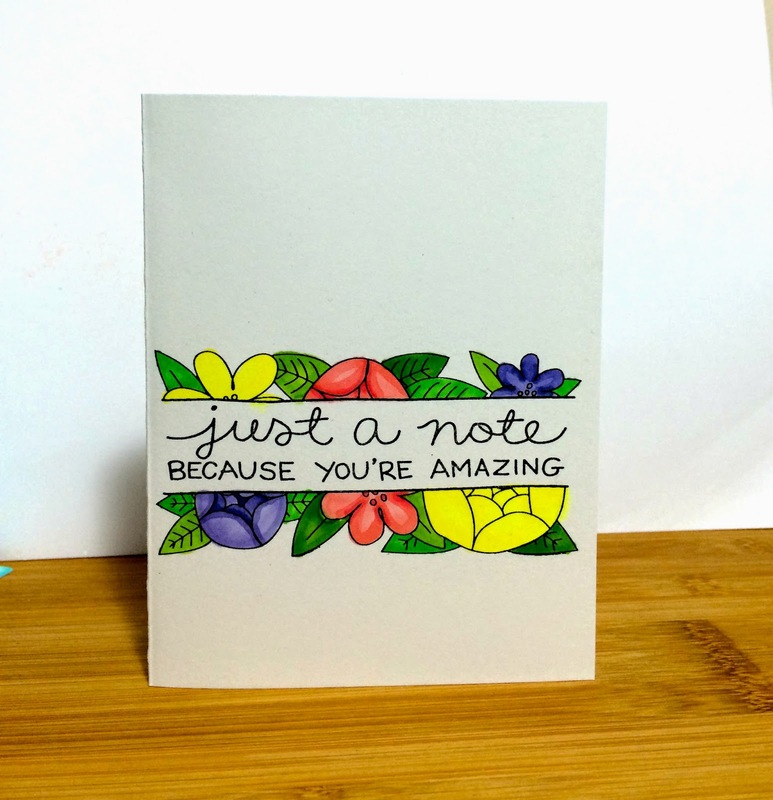 Both of your cards with the "just amazing" sentiment are beautiful and so different from each other. What a great custom stamp! Love it! I'm a longtime follower of Britta's and wish her well in her new venture. Wow...both of those projects are just beautiful! love the fonts and can't wait to see what you can do with the customized stamps!! That black and silver card is CLASSY!! The custom stamp added a special touch you don't normally see with handmade cards. 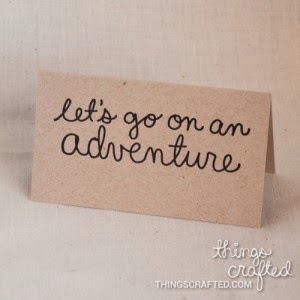 Love the stamps and your cards- the "adventure" stamp makes me want to go on an adventure!!! I love the contrast between your first two cards, using the same stamp. So inspirational! The possibilities are endless. I am giddy. Design your own stamps?! Whee! Very nice simple elegant cards! I love the font in the stamps. Thanks for the opportunity to win one! Wow, easy peasey one layer card! Your stamp is adorable a, love the cards too. TFS . I'll have to check out their site. I need a new stamp for the back of my cards. Wow, I am totally impressed by Britta's artistry. Thanks so much for sharing how the stamp was designed. The cards you made with the stamp are wonderful. I love the "adventure" stamp! cute stamps with great sentiments! AMAZING!! I love those custom made stamps and especially what you've made out of it!! Thanks so much for sharing!! wow! I really like how you showed to different cards with the same stamp...beautiful! Great cards and stamps - thanks so much! Your two cards are just beautiful with that custom stamp. The images surrounding the sentiment make it very versatile (and beautiful)! Your custom stamp is a wonderful design and so versatile. I do a lot of Thank You Cards and I am always looking for new sentiments -- I do love the Thank You! I just love that stamp. TFS, and thanks for a chance to win. Can't decide which of your beautiful cards I like best - I guess I'll just have to CASE them both! Thank you! I love the stamps you designed! The possibilities are endless! Love it, so many different ways I can think of using. Would be a super addition to anyone's crafting abilities. I love the fonts you chose! Adorable! These are great designs! Thank you for sharing. I love your design. Beautiful. Love the font on those sentiments. love the stamp you ended up with...my wheels are turning! Your custom stamp is just gorgeous! I especially love the look just as an "elegant" outline. Love the handwriting in the stamps, great touch to a handmade card, love that. Thanks for sharing. Wow, and i was thinking just verbiage. Thanks for cluing me in. love it. I love the custom stamp you and Britta designed. This is a great concept for stampers. Thanks for the lovely cards showing versatility of the stamp. I love the bold colors you used, and also the versatility of this! I love the idea of a custom stamp! And your design, esp the silver embossed one. Love the font on the stamps. Everyone is so creative. So so cute! It's such a great thing having stamps with the sentiment you want, it makes it all so unique:) Thank you for the chance to win!! The script font is a winner! two different cards but both are beautiful! The font is absolutely awesome! Thanks so much for the two different ways to view one stamp, I want to try that Too! Your enthusiasm is contagious! I love the black with the silver. Spot on awesome and the stamp is perfect. What a great design! I really love that second card with the embossing, really elegant! Wonderful stamps. I like the different looks you achieved with the first one. Beautiful cards & so different using the same stamp. Your cards are beautiful and I love the design you created. I love this! It is so versatile. You can use the border with other words by just not inking the words and vice versa. Very cool and a good bang for you buck. I love your custom stamp, and your cards. Beautiful coloring and fun design on the first one, love the elegance of the 2nd card! TFS. Gorgeous custom stamp! I would put pigment powder on the black card. Thank You for the chance to win. Very cool stamp. Wishing this new business tons of success! great stamps and i love what you did with them! Oh, love your two very distinct cards using the same stamp! They are both lovely! you are surely right - they are so versatile, love both cards!!!!! Beautiful stamp you designed. That adventure one is calling to me, too. This is so cute!! I love your cards! love the font on this stamp and how you used it! WOW - the stamp that Britta designed for you is ABSOLUTELY FABULOUS Linda!!! AND the cards you created with it are SERIOUSLY AWESOME - WONDERFUL to see the totally different look you can get from using the same stamp => THANK YOU for sharing your CREATIVE INSPIRATION!!! So much fun! It would be so nice to finally have a custom stamp in my native language! Thank you! I love your stamp and the reminder that stamps can look very different depending what you do with them Thanks for sharing. very fun stamps! huge congrats to Britta! Love the new stamps and the selection of sizes. Good luck in your new business. Fun stamps! Love the cards! Loving everyone's stamps and yours is no exception! Love this stamp and shows why one needs a few custom stamps!!! Linda, your custom stamp by Britta is perfect. So many times I feel the need to let people know how amazing they are. Love the two ways you used this stamp to make it look totally different. Great job! Love your cards with that great stamp. Cute cards! I love the custom stamp. This is one of the cutest stamps I have ever seen.i love the flowers. So so beautiful. love this new stamp line by Britta! your black card is fab. This one is awesome as well!! Love the cards you made with it! With all of them! Such beautiful cards and I love the font! 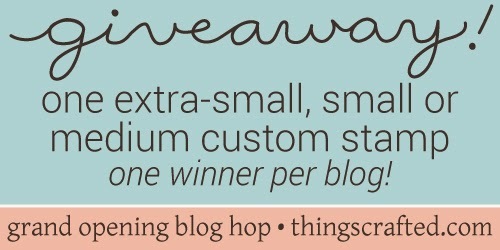 © LINDA TRACE DESIGNS: ThingsCrafted Grand Opening BLOG HOP!